Do you have condensation on your windows, or water on your window sills? This is a common problem in Wellington (and indeed all New Zealand) homes, and there are several things you can do to help. Two very important things are reducing the sources of moisture inside your home and providing more ventilation- I will talk more about these in a later post. However for now I want to concentrate on one of the most important sources of moisture, and that is the water vapour that can come up through your floorboards from the ground underneath the house. According to research done by Consumer New Zealand, this can amount to as much as 25 litres per day!! Parts of Wellington that are particularly prone to damp ground include anywhere in the valleys or nearby local streams or rivers. Hence homes in most parts of Wellington, and just about the whole Hutt Valley can be prone to condensation. If your lawns get soft in winter ( soft enough for medium high-heeled shoes to sink into), or you have the kind of soil conditions where tree ferns flourish, you probably get damp ground in winter…My own house comes into this category. 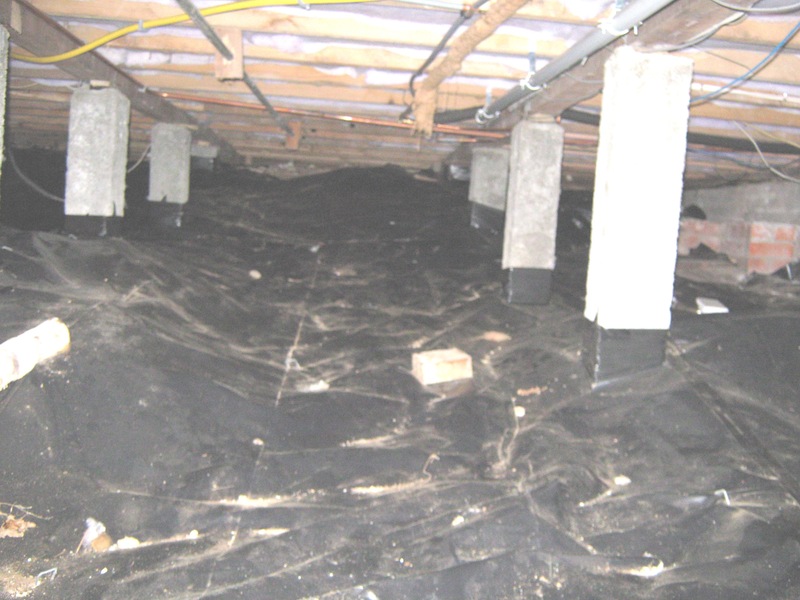 However, the good news is this problem can often be easily solved… by putting a plastic (polythene) moisture barrier on the ground under the house, as shown in the photo below. It is relatively inexpensive (installed cost about $6 per square metre, cost of materials about $2 per square metre if you do it yourself). You need to make sure the polythene sheets overlay each other by about 10 cm and taped with PVC tape. The sheets should be taped around the piles and bought up the sides of the perimeter of the house.. I can tell you that it is effective. Since we installed ours two years ago (along with insulation in the ceiling , and extractor fans in kitchen and bathroom) we’ve had nothing more than a mere ocassional fogging on the windows and the bread doesn’t go mouldy any more!! Plus the house being drier, is much easier to heat. I’ve given advice to many homeowners on this issue and am happy to provide additional advice to anyone who needs it , just use the form below to contact me, or comment on this post! Looks great, do you have any contacts for contractors? We have a tight crawl space. I have just brought a vapour barrier for under my house and wodering if you could give me some helpful tips on how to cut/tape up around piles and how far up around the perimeter.